The New Orleans Jazz and Heritage Festival is full of tough acts to follow. 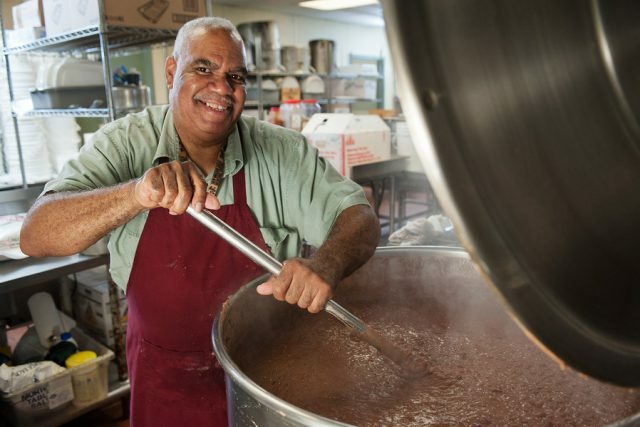 And when it comes to the red beans and rice served at Jazz Fest, legendary restaurateur Buster Holmes was perhaps the toughest act of all. But Judy Burks did just that, taking the reins from Holmes in the early 1970s and cooking up an empire built on Camellia beans that is still going strong today. At his namesake French Quarter restaurant, Holmes served his renowned red beans to everyone from Preservation Hall jazzmen to Louis Armstrong, Vincent Price, and Woody Allen. So he perhaps viewed his red-beans gig at the then-tiny Jazz Fest as just a sideline. He told organizers he would only cook 100 pounds. Enter Judy Burks and her then-boyfriend Albert Sabi. The pair had worked the 1973 Jazz Fest serving up Cuban black beans based on a recipe from Sabi’s mother. However, as astonishing as it sounds today, the black beans were a hard sell, even as the couple doled out free samples on small plastic spoons. There were “not a lot of adventurous eaters in New Orleans” at the time, Burks recalled. “That looks like mud,” one fest-goer told her. In the early ‘70s, only about 20 food booths were operating. 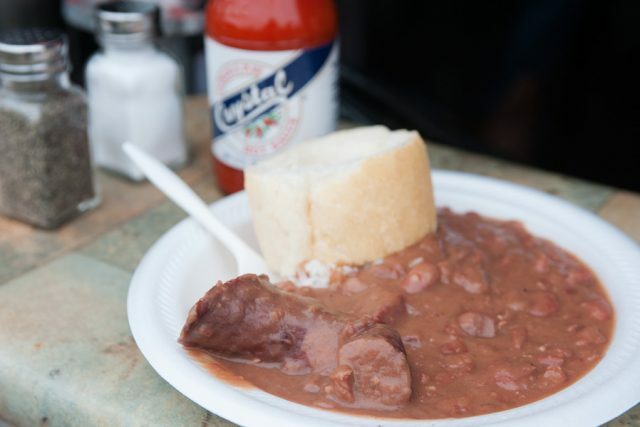 When Holmes made it clear that 100 pounds of his famous red beans was all he was going to provide, Jazz Fest organizers wanted more. They approached Burks and Sabi about changing their beans from black to red. The couple agreed. Though Holmes eventually bowed out of the festival, he continued with his unquenchable gusto for life until 1994, when at age 89 he received a jazz funeral send-off worthy of red-bean royalty. 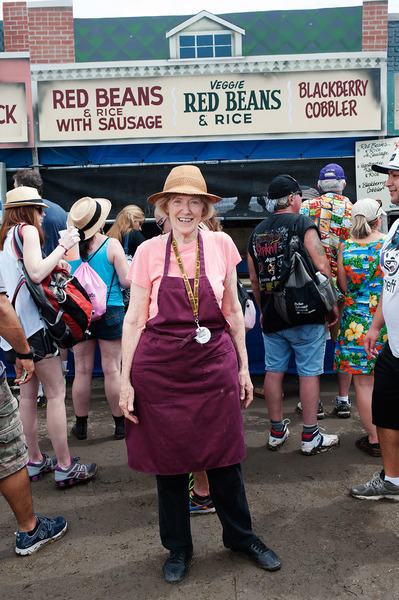 Forty years later, Burks is the Jazz Fest’s reigning queen of red beans. Locals and tourists alike feast on her definitive recipe at what has become the most famous music festival in the world. 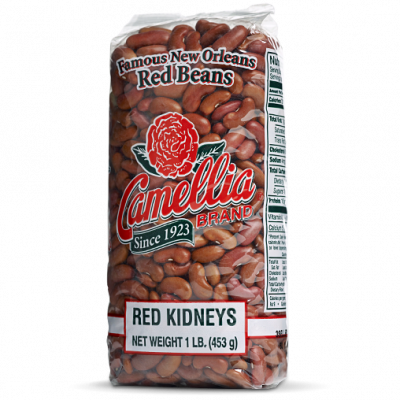 Burks has tinkered with the ingredients over the decades, but she says there has “always” been one constant: Camellia red beans. “No rocks, no mess, always good, so New Orleans,” Burks said of the product. She buys Camellia’s 25-lb. sacks and goes through an astounding 1,200 pounds every Jazz Fest! With roots in the Tangipahoa Parish town of Amite, as an eighth-grader Burks moved with her parents to the New Orleans suburb of Metairie and attended East Jefferson High School. She majored in art at Southeastern Louisiana University in Hammond and later earned master’s degrees from UNO and Tulane in English and fine arts, respectively. Over the years she has worked as a teacher and arts-program coordinator in the New Orleans public school system, and her paintings have been on display at local galleries. Burks was headed off to Europe with boyfriend Albert when she got her first taste of Jazz Fest in 1973. Bitten by the bug, she and Albert realized that cooking at the fest could be a pretty decent part-time gig. In the early days, when the festival was only a single weekend, it was easy to run the booth. In later years, as Jazz Fest grew to encompass successive extended weekends, she managed to take time off without pay from the school system to work the fest. It was during her job as visual-arts coordinator at the New Orleans Center for Creative Arts (NOCCA) that she managed to find the perfect sausage for her beans. Using the teachers lounge as a forum for a blind taste test, she rounded up several different brands and laid them out in tiny cups. The winner: Richard’s links from the Cajun town of Church Point, the brand she still uses today. Burks feels that her recipe has been “perfect” for at least the past 10 years. On the road to perfecting her Platonic dish, over the years she’s learned a few tricks, including the power of white pepper. It’s “aromatic and blends well,” Burks said. 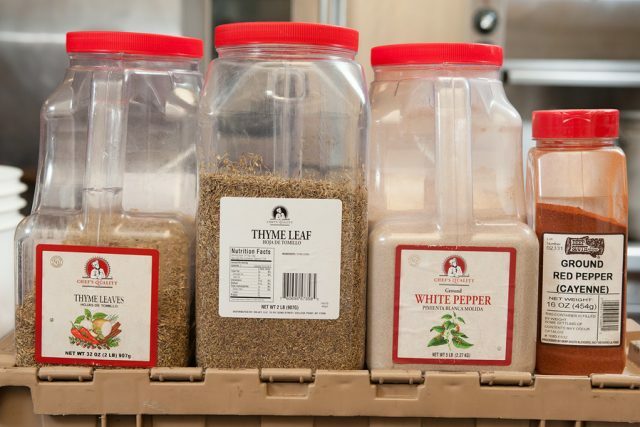 She uses about five times as much white pepper as black pepper. As for rice, she now uses a parboiled product to avoid a “glutinous mess of overcooked rice.” For many years, following the advice of “some little old ladies from LaPlace,” she stored the rice in small individually prepared Ziploc bags to keep it fresh — until a fellow food vendor convinced her to switch to 5-gallon buckets for convenience’s sake. For French bread accompaniment, her go-to brand is Leidenheimer of New Orleans. Burks also sells her own blackberry cobbler pie, and in earlier years, she offered iced tea. Vegetarian fest-goers from around the world rejoiced in the 1990s when Burks made a major breakthrough: a meatless version of red beans. Many customers simply can’t believe that she conjures up such a robust flavor without using meat. Her secret: adding extra canola oil to enhance the dish’s creaminess. She now sells about one pot of vegetarian beans for every three pots of sausage beans. 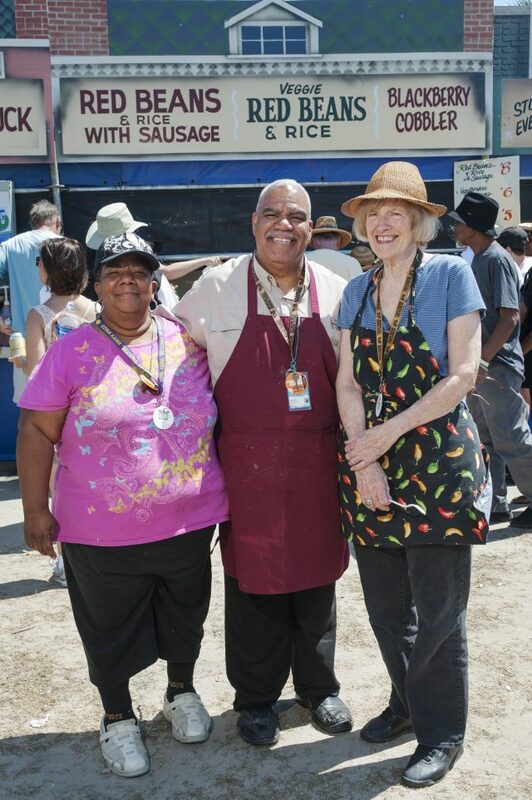 Over 40 years at Jazz Fest, Burks has witnessed and weathered many changes. On a personal level, her original partner in the business, Albert, passed away in 1987. “I did the ’87 festival by myself,” Burks recalled. 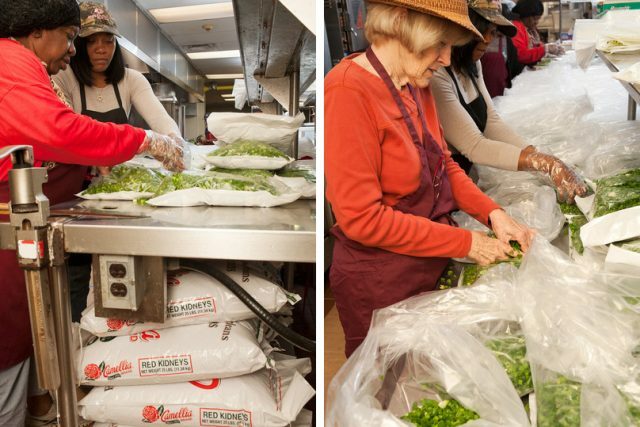 Ingredients for each large pot of Red Beans are prepped and stored in bags – parsley and green onions are being prepared above. But serendipity soon struck when she encountered a former student from her first year as a teacher. “He started out coming to help me in the kitchen, then he’d help out in the booth. Now Morris Douglas and his sister, Pam, are full-time partners,” Burks told The Times-Picayune in 1999. The business is now known as Burks & Douglas. 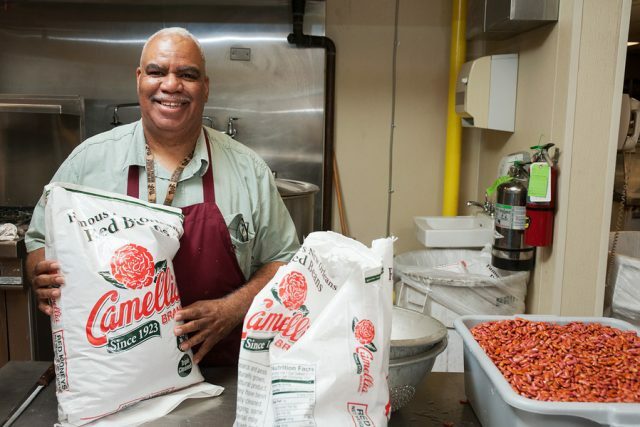 You might say that family is another key ingredient to Burks’ red beans. Burks’ life partner, a sculptor, also helps out at the booth, specializing in the blackberry cobbler. And partners Morris and Pam Douglas have several relatives active in the business. Burks also has a corps of volunteers who help out in exchange for free Jazz Fest tickets, including a couple returning this year from Paris, France, for yet another tour of duty. “Seeing the same people is so much fun,” she said. Burks had the business swinging effortlessly along like a crack jazz band — until tragedy struck. On Dec. 17, 1993, a seven-alarm fire destroyed the Fair Grounds’ historic clubhouse. Burks remembers exactly where she was the moment she learned the devastating news. And appropriately enough, red beans were involved. Things were better until Aug. 29, 2005, when the federal levees failed during Hurricane Katrina and New Orleans flooded. As a resident of Uptown’s “sliver by the river,” Burks mostly escaped the physical devastation inflicted on other parts of the city. And like most locals, she was determined to go on, and that meant firing up the city’s most beloved comfort food once again at the Fair Grounds. Like a good pot of red beans, Burks just improves with age. Asked how long she plans to keep on stirring the pot, Burks insists she still gets a thrill from the annual ritual. Categories: Bean Love Celebrate the Season Let's Cook!